Sensory integration activities can have a massive impact on a child’s development. 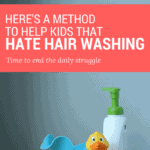 Learn powerful ones that are easy for parents to do at home! I was so proud of him as he pulled himself up the small wooden ramp on a scooter board, as he crossed his arms one over the next with both of his hands alternating. This activity was difficult for him in so many ways, I knew this as an occupational therapist, but I wondered if his mom knew how powerful the activity was for him as she watched through the one sided glass a few feet away. Because to anyone watching, it would look like we were just having fun, playing really. And, while that absolutely is how sensory integration therapy should look, there is a lot more going on under the surface. 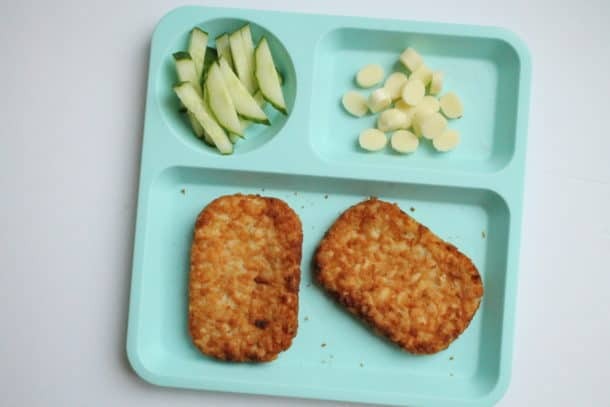 Sensory integration may look a little strange at first glance, just like the child pulling himself up a small ramp with a rope while laying on his belly over a scooter board, but changes are happening in the brain when they participate in these activities that directly affect their development and their ability to learn. Bilateral Integration – The ability to use both hands/arms/legs/feet for activities. Crucial skills for reading and other learning. Crossing Midline – This is when a child uses their arm or leg to cross the center of their body, which is difficult for some kids. This is important stuff for a child, both now, and as they grow. 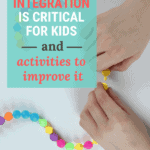 Does Your Kid Need Sensory Integration Activities? 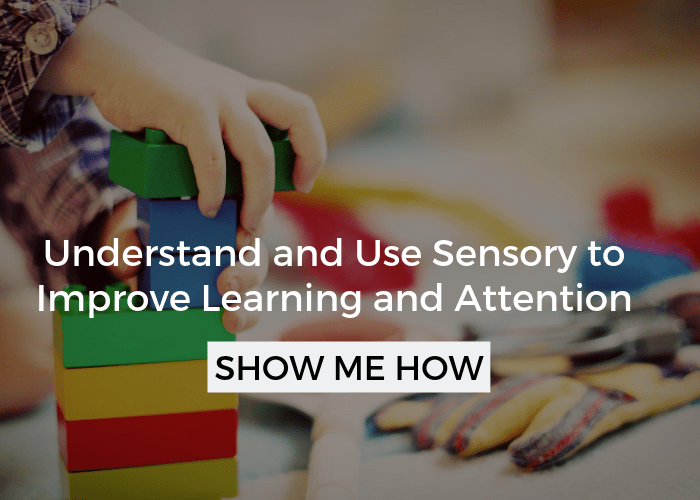 Sensory integration activities are common in a therapy clinic, but they are crucial for some kids with sensory needs and developmental delays because they are targeted to helping your child improve their actual sensory processing on a neurological level. That means that even if your child doesn’t have any particular needs, these activities are sooo good for their development in general! 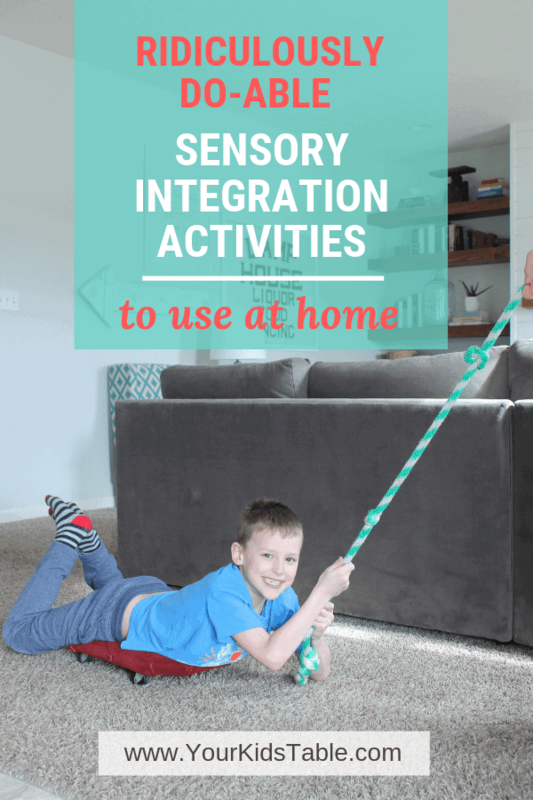 The point is that sensory integration activities are beneficial for any child and, as an occupational therapist, I highly recommend sprinkling them into your regular play. Well then, sensory integration activities can be key to overcoming those challenges. You’re about to learn some easy but powerful ones to use in your home! If your child does tick a lot of the boxes above, you’ll also want to consider getting an evaluation from an occupational therapist that specializes in sensory integration. Learn more about sensory integration therapy. What If My Child Doesn’t Want to Do the Activity? If you’ve read any of my other sensory posts, then you already know that I ALWAYS tell you to NEVER make a child participate in a sensory activity of any sort because it can cause more damage to their sensory processing. As parents, we know what’s good for our kids and we just want to show them that it’s not that big of a deal. But, when a child that has sensory sensitivities is resisting an activity, it’s likely because the sensation they’re going to experience will be extremely uncomfortable, maybe even painful. We know that we all perceive sensations at least a little differently. So, what may feel like a fun swing ride to you, could be a terror filled experience for you child. That’s why it’s important to always encourage and demonstrate, but never force. 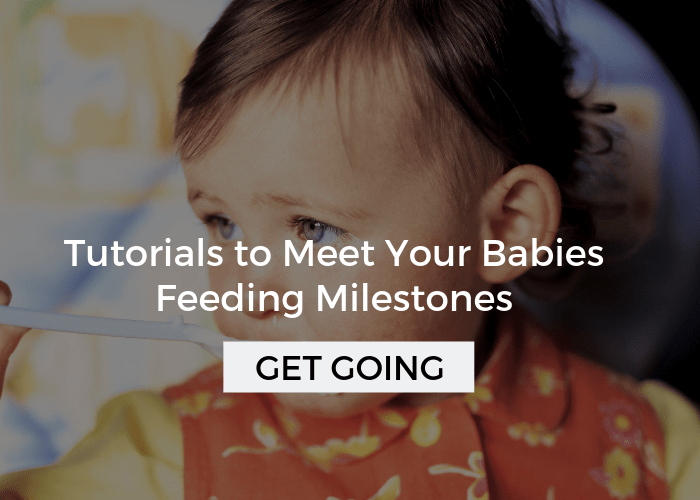 Since some of these activities are important for their development, you’ll want to break them down into smaller steps to make it easier for them to participate. Like with the ball activity below. Your child may freak out if you sit them on top of the ball, so your first goal is just to get them to lean on it with their feet still on the ground. Then, maybe, they can take off another foot. If that’s too hard for your child, back it up even more and try just touching or pushing the ball. Sure, you aren’t getting to the actual activity yet, but that’s okay, you’re on your way. As you present these activities, keep it fun and try not to make it seem too structured or add a strict schedule to it because some kids will resist that. 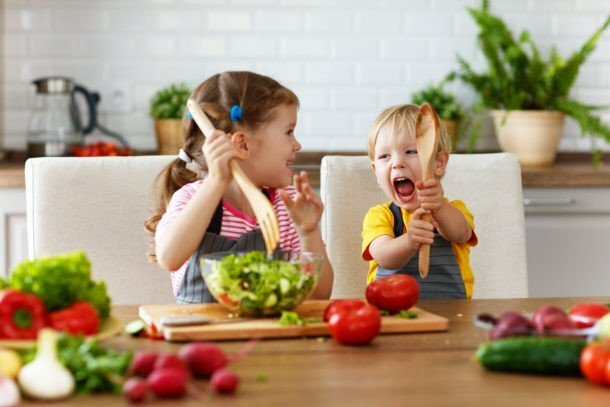 If your child seems to be refusing to participate because the activities are challenging or they aren’t interested, then give them a choice between two different activities, or decide on a time together that you can “play”. That could be right before snack or after they’ve had some free play time. It’s whatever works for both of you! You’ll find 6 sensory integration activities below. There are many more, but these are my top picks for the home. These specific activities also target deeper sensory integration and address those skills we talked about above. However, if you want inspiration for more sensory integration activities in general, then you’ll want to check out sensory diet activities. 1. Plus Sign on Ball – Have your child sit on top of large yoga or therapy ball. (This is an inexpensive version.) Then, while you firmly hold their hips, push down a little into the ball and slowly roll the ball in the shape of a plus sign. That’s backwards and forward and side to side. This sensory integration activity strengthens the core and forces a child to shift their weight and right their posture so they don’t fall over! Make it easier: Use a smaller ball or don’t fill it up with as much air so it’s a little flat. You’re child won’t get as much movement. Make it more challenging: Use a larger ball, hold onto their hips more loosely, and/or fill the ball with a lot of air. 2. Scooter Board on Belly – Using a simple scooter board, like this one, while they lay over it on their belly. Just like you see my son doing. It provides so much sensory input and improves strength and coordination. Have your child push themselves wherever they can with the palms of their hands. Make it easier: Give them some small pushes, take frequent breaks, and if you’re child is afraid of the movement, have them start by sitting on top or just pushing the scooter board. Make it more challenging: Have your child collect beanbags that are placed 1-2 feet high so they have to reach up. Think about placing on a stool or box. This causes them to have to extend and hold their core up! Another idea is to use a rope, you hold one side while your child pulls themselves towards you – alternating those arms for bilateral integration! 3. Climb a Ladder, Rock Wall, or the Monkey Bars – You may not have any of these at your house, but most parks have at least one. Get your child there, even in cooler temps, and get them using these climbing features. They hit every mark for sensory integration! 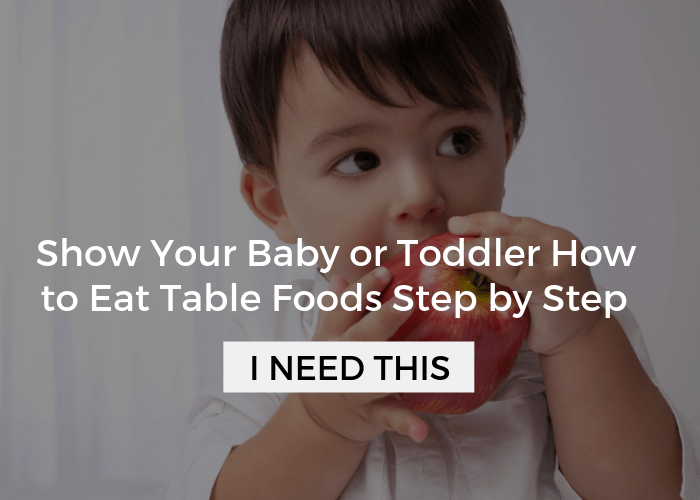 Make it easier: Help your child by supporting their legs or hips as they climb. Or, simply keeping a firm hand on them can help those fears of movement. Make it more challenging: Focus on the monkey bars, a difficult skill that requires core strength and solid bilateral coordination. 4. 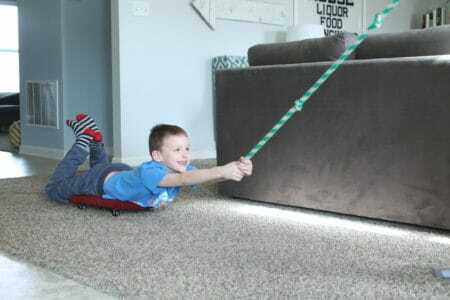 Wheelbarrow Walk – This classic kid’s game is brimming over with sensory integration goodness. Simply have your child get onto all fours and pick up their back legs while encouraging them to walk on their hands. Make it easier: Hold them closer to their knees or hips and try short distances or even just standing still. Make it more challenging: Only hold their feet and try racing or timing how fast they can get from point A to point B. 5. 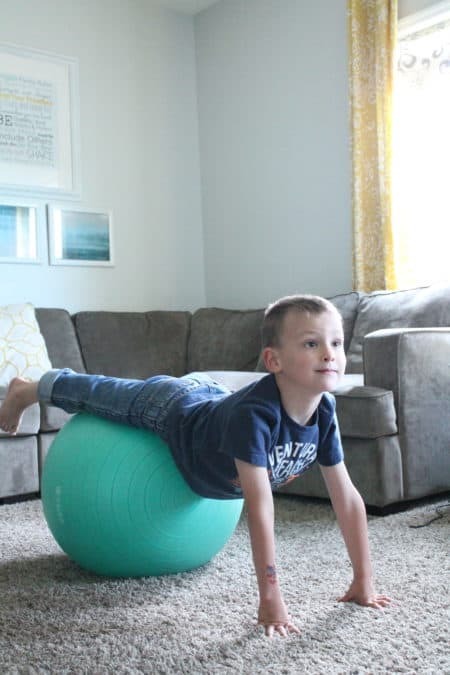 Crawl Forward While Over a Ball – Get that big yoga ball out again and have your child lay over it on their belly and catch themselves with their hands. You can push and pull them back quickly and encourage them to walk out with their hands, as far as they can go. Make it easier: Hold them firmly at their hips when they roll forward. And, if they’re scared of their feet leaving the ground, have them try with keeping one or two feet on the ground. 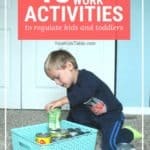 Make it more challenging: When your child walks all the way out on their hands, have them reach up and grab a small toy that you’re holding or that’s placed on table, etc. 6. Swing – If you have the space, an affordable swing that you can hang in a tree, inside, or from a swing set is this spiderweb one. I love this because your child can lay on their belly to swing on it. The simple back and forth motion in this position is awesome sensory integration. But, swinging back and forth on a play ground swing, especially when a child is pumping their legs independently, is good too. 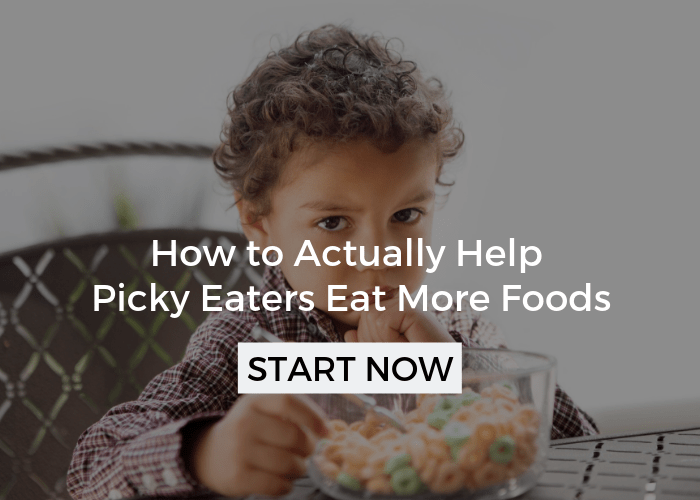 Make it more challenging: With the swing low to the ground, have your child pick up bean bags from the ground as they swing by on their belly and then throw them into a bucket, all while the swing is in motion. Awesome hand eye coordination and visual perceptual skills. There you have it, 6 powerful sensory integration activities, that, when done on a regular basis, can have a profound affect on your child’s development! Want a simple guideline on how and when to plan your child’s sensory integration activities? It can be a big help! 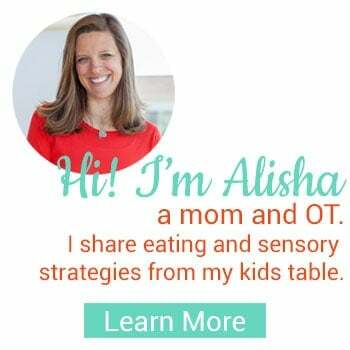 Check out this sensory diet template, you can download, print, and use if for your child! Click the button below to have me send one to your inbox!